Info-Ski Mont-Tremblant is your private guide on the trails. Want to find out the ski conditions for a certain trail, the best viewpoints or the shortest way back to the village? Ask Luc L’Espérance or one of his Info-Ski colleagues. That’s what they’re there for! 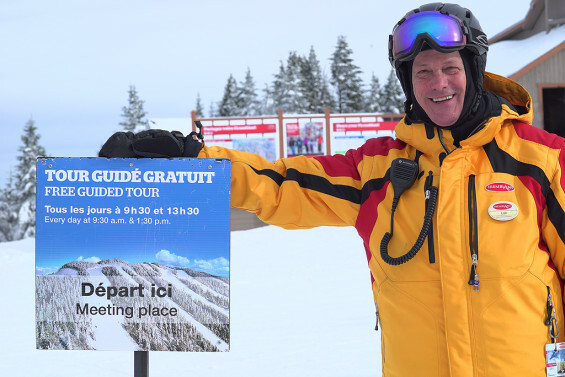 Volunteer Luc L’Espérance has been providing Info-Ski services at Mont-Tremblant for 3 years. Luc knows the Mont-Tremblant ski resort inside out. This smiling retiree can be seen darting down the slopes in a bright yellow jacket with a big question mark on the back. I met him at the top of the hill. Friendly and passionate about skiing, he tells us a little bit about his role. Luc L’Espérence is what we call an Info-Ski guide; in other words, he’s a volunteer whose job it is to help skiers on the slopes. No, Info-Ski guides are not patrollers or monitors but in fact information guides. A volunteer guide starts the day by assessing the condition of the trails. “This assessment helps us inform skiers of the conditions of the various trails,” explained Luc L’Espérance. “We can then warn people about trails that are closed, icy, etc.” He also checks the weather and possible changes in ski conditions. 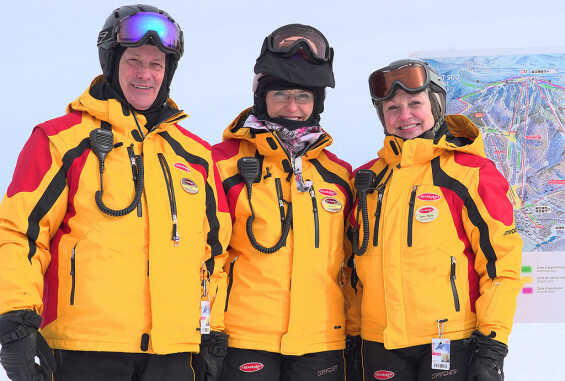 Three out of some 85 Info-Ski guides who can be found on the slopes at Mont-Tremblant. Info-Ski guides also monitor skiers’ safety: “We make sure skiers are well dressed to prevent them from getting frostbite,” said Luc.